Target has a great B1G1 FREE mobile coupon for Sunglasses, Jewelry and Watches up to $58.99! This deal is perfect for Christmas gifts! $12.01 for two (2) or around $6 a piece! $12.75 for two (2) or around $6.38 a piece! UPDATE: I was able to purchase the two (2) watches below for $13.58! Plus I found out that if you can get the cashier to ring up the more expensive one last the coupon takes off the price of the last one scanned. 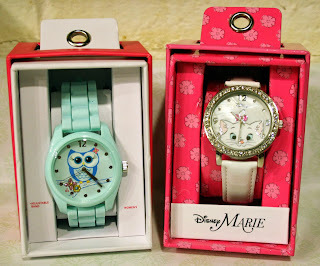 Example: The Owl Watch cost $14.99 and the Disney Watch cost $16.99, totaling $31.98. Since the Disney Watch was rung up last, $16.99 was taken off! Remember the B1G1 FREE coupon is for ANY watch! ANOTHER UPDATE: Apparently this coupon will take off the higher item and is not a glitch! Here is what Target wrote on their Facebook Fan Page! So if you purchase a small item on clearnace, then purchase a watch $58.99 or less will be FREE! Text OFFERS to 827438 to get this coupon!